Papadakis pointed out in 1991 that signal processing and information theory methods were neglected in nondestructive testing (NDT). During the 1990's NDT laboratories, both academic and industrial evaluated signal processing tools or image processing methods. Research extended to artificial intelligence, neural networks, and even more recently to data fusion. We shall limit this article to the extraction of information from an image or a signal. The LCND laboratory contributes to develop segmentation methods adapted to ultrasonic, eddy current and radioscopic images. In the first part we shall present defect detection in thick austenitic weld (80 mm) through ultrasonic imaging. The DTVG method (Delta Temporel Variance des Gradients) concurrently exploits two characteristics of the defect in the image : short temporal response (DT criterium) and spatial stability of the echo (criterium of the variance of temporal gradients VG). The next part concerns automatic thresholding technique using cooccurrence matrix (bidimensionnal histogram). The histogram of an NDT image is often unimodal and does not allow to clearly define a threshold. It is particularly true for ultrasonic images. In numerous cases we can show that bi-dimensional histograms enable to separate defects from noise zones. Very interesting results are obtained with ultrasonic images (BSCAN images) and with eddy current images (CSCAN images). A third part shows how spectral analysis applied to ultrasonic signal could be used to determine the concrete setting time. Correlation with migrographies shows that the propagation of ultrasounds is modified by the continuous evolution of the microstructure (ettringite, CSH, etc..) during the concrete setting. The last example describes a method that combine radioscopic images and retroprojection algorithm to permit a solution to test a circular weld. The inner part of the welded component is too absorbent to allow radiographic testing. Nondestructive Testing is a collection of different methods: ultrasonics, radiography, Eddy current, etc. Some of these techniques give results, "naturally", in the form of signals, others in an image form. The co-existence of the different methods can be justified by the general different characteristics of the parts to be tested. The vital parts, elabored in mechanically high-performance materials seem however more and more difficult to be tested. The originality of our method consists in taking into account, to solve the problem of material control, the exploitation of a set of information gathered in an image form. We thus resort to criteria originating in the physics of the methods used, to which image processing methods can be applied. This fact allows to establish a link in fully expanding sciences: image processing, mainly used in satellite or medical imaging, and mechanics. We present, as an illustration of these methods, four examples of digital processes of images obtained by different nondestructive testing solutions. In the case of coarse grained austenitic stainless steel, an important diminution in the defect detection possibilities is noted. The wave amplitude is attenuated and can also be deviated, according to the importance of anisotropy and/or heterogeneity. We show an image processing method which is entirely automatic aimed at improving the defect detection in the ultrasonic testing. The obtained ultrasonic image (BSCAN or DSCAN) is analyzed from criteria different from the analysis of the sole amplitude, which allows processing even in case of a low signal to noise ratio.The basic principle of the method consists in segmenting the image into two classes thanks to a specific data processing as it is naturally done by the visual perception system. The first criterion (VG) studies the spatial stability of the maximum temporal gradient for each signal of the ultrasonic image. The variance of the position of the highest gradient is calculated. It implies to choose a window size in which variance is calculated. A defect zone has a higher stability (VG is small) than a noise zone. The second stage consists in getting interested in the vertical distribution of the grey levels: a defect is expected as a determinist and short temporal event, corresponding to a sharp reflection on an interface. The second criterion (DT) takes into account the time difference between the maximum amplitude of each signal and this value reduced by 6dB. In the presence of a defect, the temporal distance is relatively small, whereas it becames important in the presence of a noise as the algorithm selects automatically among the possible solutions which gives the maximum temporal distance. In order to automate the segmentation and to obtain a binary decision : defect or no defect, two thresholds are automatically calculated from a reference image. 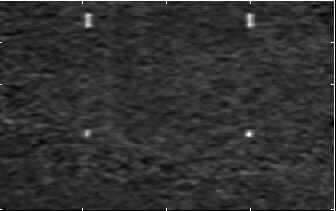 This reference image is a noise image where no defects are present. So we obtain the limit of the criterium DT, it means the lowest value possible of the temporal distance DT in the case of an image of noise. Similarly the lowest value of the variance in this image determines the reference level to know if there is a defect or not, using VG criterium . The calculation of DTVG is then a binary one: DTVG is equal to 1 if VG and DT are simultaneously below the two reference limits, which means that a defect is likely to be present. Otherwise, DTVG is null. Method can process images with any kind of incidence (null or oblique). The binary image is shown to the operator, black events corresponding to DTVG =1 (Figures 1 and 2). These figures show results of the complete treatment for 3 defects (holes) in an austenoferritic steel sample with a 80 mm thickness. After DTVG processing, the structural noise is cancelled and defects appear unambiguously. Moreover, the complete automation of the method is appreciated. To meet the demand for processing very high volumes of data, we show a method of volume automatic thresholding. The thresholding techniques from the image histogram are inadequate as the ultrasonic image histogram is unimodal. 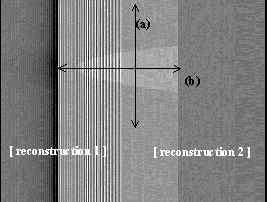 The study of the image with the cooccurrence matrix which is a two dimensional histogram allows to clearly show the noise-defect transition . We use the definition of the matrix exploiting a vector " " of modulus r and angle q. The cooccurrence matrix indicates the distribution of couples of pixels of i and j amplitudes separated by the vector . We build a symmetric matrix. A coefficient of the matrix (Cij) can thus be considered as the probability of obtaining two pixels separated by such that their amplitudes are equal to i and j. Our ultrasonic images are built from sinusoidal type signals. For a coding between 0 and 255, the greater part of the pixels are close to the mean value 128. The coefficients Cij which correspond to noise to noise couples are thus in the center of the matrix. The vector d is chosen to build a star-like shaped matrix. In the case of filtered signal (positive values only) the matrix has a L-shape (figure 6). Coefficients representative of the couples that contain at least one pixel of defect are along the branches of the matrix and noise is concentrated in the center of the matrix for sinusoïdal signals or in the upper-left corner for filtered signals (figure 6). A threshold t inside the matrix separates Cij coefficients below or above the threshold. The idea is to follow the evolution of the coefficients in the matrix in relation to the value of t and to find the transition between the center of the matrix and the branches. In order to follow this evolution, we test several measures and we select the Square of Mean Distance to the Center of Gravity Measure (abbreviation DMB) which quantifies the mean dispersion of the coefficients Cij. This method is at present validated on images which have at least one distinguishable echo. The modeling has shown that it needs one echo of SNR higher than 1.6. The choice of vector could be done visually by an operator but a method is also defined to automatically calculated the best choice of vector d thanks to the analyse of the matrix shape for several increasing vectors . On the other hand, when the method is valid, the threshold value is a little higher than the noise and so allows to locate lower amplitude defects. The method can therefore be improved to obtain a satisfactory detection threshold on volumes which contain only low amplitude defects. The problem is to work on matrix shape analysis. The generalization of this method enables to process eddy current images. Data is presented as CSCAN with positive values (figure 5). It is furthermore possible to improve the thresholding strength through the definition of a cooperation rule between two threshold assessment measures. This rule is also used to reduce time of automated processing by limiting the number of vectors . These measures are calculated from the image cooccurrence matrix. The aim is to build a thresholding method that gives a threshold value but also an indicator which allows the operator to know if the methodology well applies to the processed image. The indicator is set by learning process. Two thresholds are given by two different measures, and the distribution of coefficients in the matrix is also analysed to validate the L-shape. A validation domain is then set when there is a low difference between the two thresholds and when the degree of confidence in the matrix shape is high. In the figure 7 the limits are defined from 56 images. Thresholding solution is validated if threshold difference is lower than 10 and if degree of confidence is greater than 95% . This method could be adapted to process radioscopic images as the noise distribution in this kind of images also gives unimodal histogram. Fig 9: A. image time-PSD. B. PSD at time 70 hours. This work shows a new approach to measure the setting time of specific concretes used for dams (roller compacted concrete). The classical measure of the celerity of the ultrasonic waves transmitted in a concrete sample can no longer be used in the case of fast chemical kinetics. The celerity evolution does not present significally transition when the setting time is reached. Spectral analysis is then necessary to make a decision. An automatic acquisition chain allowed us, in real time, to obtain the spectrum of the ultrasonic signal transmitted through a concrete sample. The frequential evolution was then translated into a two-dimensional "frequency - setting time" image in which the amplitude of the Power Spectral Density (PSD) is represented according to a grey level scale. The image analysis brings to the fore the filtering effect obtained in relation to the appearance of the various constituents and the bridges linking the grains. It thus allows us to appreciate the evolution in the concrete setting time. 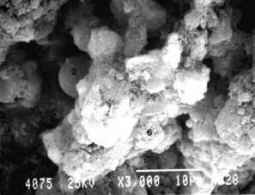 Scanning electron microscope (SEM) is used to observe more precisely the concrete's microstructure at different moments. A good correlation is obtained between the apparition or disparition of the constituents and the maximum of DSP values determined over the 15-100 kHz bandwidth . The setting time is characterized by an important formation of the CSH constituent (calcium silicate) and this corresponds to the point TP162 of the curve in figure 10. This point could be easily identified by an operator. This study is concerned with a new approach of radioscopic control dedicated to circumferential weld. We present an original method to make use of tangential radiocopic images in order to reconstruct the complete weld . 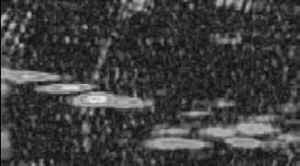 These radioscopic images represent only a part of the whole component (figure 12). This method exploits the basic idea of tomography along with the problem of hollow projections. We can then evaluate the quality of the weld from the analysis of the weld shape. This work shows the feasibility of this new approach through simulated images. The goal is to improve image quality in order to use a very simple segmentation algorithm. Other segmentation solutions exist using edge detection, local histograms and B-Splines curves . Figure 13 shows a simulated image. The model uses parallel beam as images are obtained with a microfocus tube. Two attenuation coefficients should be known : one for the parent metal, one for the melted zone. We need to know the response curve of the detection system. Complete description of this model can be found in Gueudré and al . 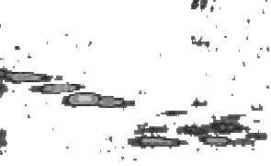 The simulated image in figure 13 is very similar to the real one and we can see that very poor contrast is obtained at the bottom of the weld (left side of the image). Classical filtered retroprojection algorithms  used in medical scanners or industrial ones need to have complete projections for a large panel of angle. Figure 12 shows that we have only partial projections of the whole piece as the inner part is too absorbent. We have to construct complete projections by using the partial projection at angle q and the one at angle q +p (the same simulated partial projection fact). Between the two partial projections we complete by zero values and we use an apodisation function to smooth the transitions. In figure 14 we show reconstructed images. The weld shape is well perceived for it appears at an homogeneous zone. Reconstruction artefacts (vertical lines) due to incomplete projections are also clearly seen. The reduction of these artefacts is effective as the algorithm uses apodisation near the limits of the projections . Figure 15 illustrates the increase in contrast in the bottom of the weld. Dotted line is the profile obtained in the radioscopic image, that is the classical image used in nondestructive testing. Normalized central ligne profiles of the weld. Reconstructed profile shows a much better transition at the left limit of the weld (indicated by the vertical line in figure 15), but reconstruction is quite noisy due to incomplete projections. So automatic thresholding solution could be difficult. Nevertheless the combination of radioscopic images and retroprojection algorithms adapted to the hollow projections enables to have a good segmentation solution. The major originality of research described in this paper concerns the choice, upstream from the data analysis, of a presentation of the information in an image form. We try to translate the very good discriminant power of the human eye in efficient algorithms. Our approach is so very similar to artificial intelligence concept, or learning methods, whose interest is to reproduce as closely as possible the human diagnosis . Modelisation becomes also more and more essential to evaluate image processing or signal processing for nondestructive testing applications as experimental trials can be heavy, long and expensive. V. GARNIER, G. CORNELOUP and al, Setting time of roller compacted concrete by spectral analysis of transmitted ultrasonic signals, NDT International, vol. 28, n°1, pp. 15-22, 1995. C. GUEUDRE, J. MOYSAN, G. CORNELOUP, Geometric characterization of a circumferential seam by automatic segmentation of digitized radioscopic images, NDT&E International, Vol. 30, n°5, pp 279-285, 1997.